Holiday decorating is all about adding a bit of cheer and sparkle, a task made easier by the recent popularity of all things metallic. With winter’s shortage of daylight, the sheen of metallic furnishings, fabric and decorative pieces can add a dose of the brightness and warmth so many of us are seeking. The trick, she says, is not going overboard with too much glittery goodness. We asked Huh and two other interior design experts — Massachusetts-based Kristina Crestin, and Sarah Fishburne, director of trend and design for The Home Depot — for advice on using metallics during the holidays in ways that will look great all winter. Fishburne has been seeing a trend toward softer metal shades, which look sophisticated. “A little more white going into them is the best way to describe it,” she says. The golds are paler and less brassy, the silvers appear a bit whiter, and even shades of rose gold and coppers are a bit less orange. Another way of getting metallic shine in a subtler way: Use mercury glass, which shows a range of soft colors in a metallic sheen when it catches the light. 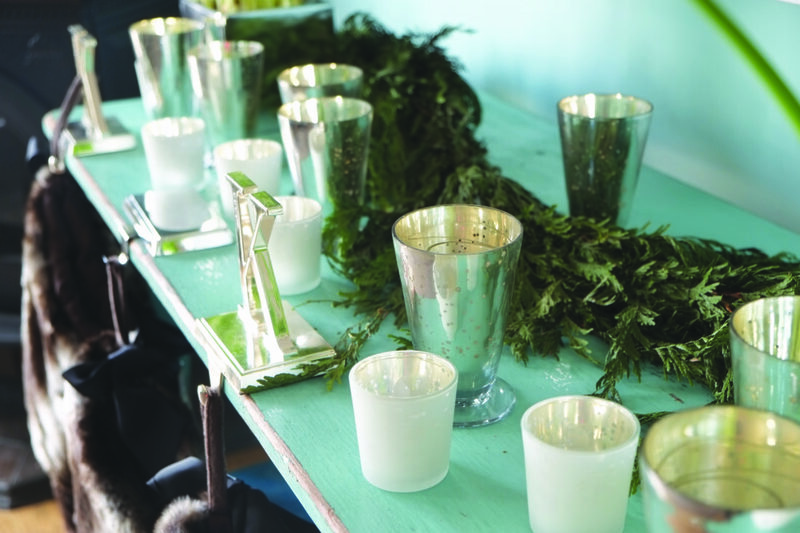 Crestin agrees: Last year, she mixed in mercury glass candleholders of different sizes with greenery along her mantel, and loved the look enough to do it again this year. They gave off a warm glow even when the candles weren’t lit, she says. Last year, after Crestin found a pretty “Merry Christmas” sign made of punched copper, she began adding more copper items to her holiday decorating. She included planters covered with copper foil (similar to gold leaf), copper serving bowls for entertaining, and LED lights on copper wire that she wove into holiday greenery. She took the same approach for a client who wanted to freshen up her holiday decorating: Crestin brought in a selection of copper ornaments for the client’s tree and mixed other copper items in throughout the room. “We used half of what she already had and then supplemented coppery tones,” she says. The technique works with any type of metal: “Maybe you edit what you have a little bit,” Crestin says, and then supplement with ornaments and decorations in copper or another metal this year. Buy a selection of simple terracotta planters or flower pots in different heights, and spray paint some of them in metallic shades, says Fishburne. “There are so many fantastic metallic spray paints,” she says, in shades of rose gold, soft golds and silvers. Fill them with poinsettias, artificial or real, in whatever colors appeal to you. If the plants begin to wilt, or you get tired of them after the holidays, keep the same pots but switch them out for succulents. Huh agrees that flower pots are a great place to add metallic accents: “You can switch out some of your usual cachepots or accessories with items that have a bit of glimmer,” she says. Finally, Crestin points out that metallic scrapbooking paper from a craft store can be the perfect way to affordably add one more dose of metallic shimmer to your holiday decorating. Buy several sheets in a color you like, and use them as a dining table runner with votive candles and little silver-toned planters on top.